Whomp whomp. There're no Hershel Greenes for sale. 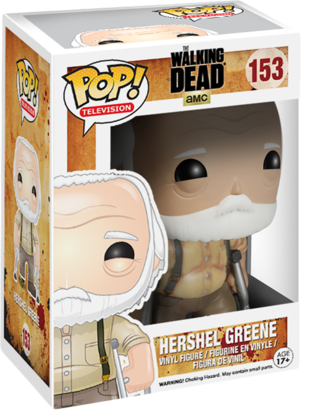 Hershel Greene is a main character and survivor of the outbreak in AMC's The Walking Dead. He is a farm owner who lived in rural Georgia for many years with his family. Hershel is the father of Maggie and Beth Greene. With the passage of time, Hershel becomes the adviser of Rick Grimes. One of the 1st of 7 figures released in the fifth wave from the Walking Dead (TV) series, The figure is 3 and 3/4 inches tall and has 1 point of articulation.